The two main exponents of the sweeper system played each other in Pairc Ui Caoimh yesterday afternoon. Waterford’s Tadhg De Burca and Shaun Murphy of Wexford are high up on the list of the amount of coverage given to individual players this season. Derek McGrath and Davy Fitzgerald are probably the two most passionate believers in the sweeper system, while several in the media such as Michael Duignan, Henry Shefflin and Diarmuid Lyng have recently taken issue with it. Who’s right? Here’s my take on it. The sweeper as employed by Wexford and Waterford has been a very effective means for dealing with a problem both teams have – they don’t have huge strength in depth, and select their teams from about 20 players. They don’t have the luxury that Kilkenny or Tipperary, or even Cork or Galway have, of being able to find 4 or 5 good players out of under-21 each year. These sides had good crops from a couple of good underage sides, and then little else besides. Good hurlers don’t grow on trees in Wexford and Waterford. So they need to make do with what they have. Both sides have a huge emphasis on fitness, being competitive and being hard to beat. I would imagine, without knowing either manager, that if they are asked where one starts with a county team, their answer would be “the first thing you need, is to be hard to beat”. That, in essence, is where the sweeper comes from. They have underdog teams, and they want to make sure that whatever happens, the scoreline is close and they are hard to beat. I know where Michael Duignan and Diarmuid Lyng and the lads are coming from. I heard it mentioned on the radio last week that the sweeper system ultimately shows a distrust in the players available. And to be fair, I think that pretty much hits the nail on the head. It does show a distrust in the ability of the players available, but that’s not an unfair assumption to make. Wexford haven’t been consistently competitive since the 90’s. 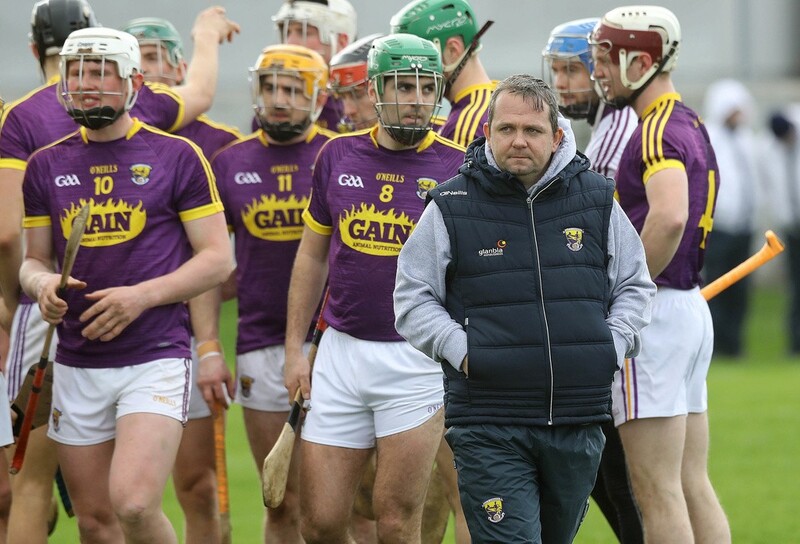 Davy Fitz’s job once he came in was to make sure that Wexford could compete. No big losses, build confidence by getting wins and build cohesion and belief within the team by developing their own style of play. Once Justin McCarthy left Waterford, the wheels came off down there and Derek McGrath has been forced to develop a new side with only a couple of veterans like Brick Walsh and Kevin Moran. The last thing a whole raft of young players coming in need is big defeats, and just like recent times in Wexford, a system was built to make sure Waterford could consistently be in with a shout in every match they play. The traditionalists are correct too though. I too don’t think a team will consistently compete for All-Irelands playing with a sweeper. The only way a team could compete consistently at All-Ireland level is if they had 5 forwards who could do the job of 6 – funnily enough both Kilkenny and Tipperary have the forwards and numbers of hurlers to do this. (If I was Tipperary I’d bring in a wing-back, move Paidi Maher to sweeper and let Callinan, Maher, two McGraths and Bubbles compete against 6 back up the other end. I’m convinced they’d win the All-Ireland if they did). I think against the very best teams that a team may struggle to get the scores, particularly goals, they need when playing with fewer men up front. It’s a problem to assess accurately though, as the teams who do play with sweepers usually have fewer scoring forwards – Wexford really just have Conor McDonald and Waterford have Shane Bennett and Maurice Shanahan (who doesn’t always start). Wexford showed a couple of limitations yesterday which Waterford exploited. While Shaun Murphy sat in front of his full-back line, Waterford put pressure on the Wexford half-back line instead: Brick Walsh, Kevin Moran and Pauraic Mahony were the guys doing the damage for the first three quarters of the game. Little ball went into Shane Bennett in this period and it was only with Wexford chasing the game and Waterford withdrawing further back that there was space for Maurice Shanahan and Brian O’Halloran to close out the game inside. Derek McGrath in fairness is very tactically astute and nullified Wexford’s spare man at the back by just never hitting the ball there. Waterford too showed a killer instinct and went after specific Wexford players, particularly Willie Devereux with Brick first and Jake Dillon then. One of the major issues with the sweeper is that teams can tend to focus on defence and not so much on attack. Waterford had a great plan that worked. What Wexford were trying to do was less obvious. Personally, I believe one of the best ways to counteract the sweeper is to puck the ball straight down on top of him, just as Tipperary did to Waterford last year. A sweeper is most valuable when covering space and being an outlet option for his teammates. Nullify him by putting the ball long on top of him to be contested. With lads like Jack Guiney, Conor Mc and Podge Doran, Wexford had options for that long ball. The closer the contest is to the sweeper, the less effective he is – a ball contested 15 yards away is what a sweeper wants, not a full forward and full back coming out under a high ball on top of him. Kilkenny too in the past have had success by doing it when Richie Power was full forward, even Waterford themselves have gone this route with Maurice in there. To me, the sweeper system currently being employed isn’t perfect, but then neither are the other systems which pass for being “traditional”. Every team wants to close off space in their half and open it up in the opponents half. Kilkenny have been doing this for years in their own way – we’ve all seen Eoin Larkin and TJ Reid winning ball around their own 45, just watch last year’s replay with Waterford. So too Tipperary in the All-Ireland final last year. Or even go back to when Duignan himself played. The Offaly style was to get to the ball first and keep it moving in; the glorious ground hurling they played opened up space inside for guys. It’s all down to what resources you have, how you can be at your most competitive and how you think you can score more than the team opposite you. Winning 0-6 to 0-5 is as good as winning 3-24 to 4-20. A manager tries to problem solve his way to victory, particularly true when managing an underdog, and sometimes this coming up with things which aren’t aesthetically wonderful. I hope both teams can transition their games next year and beyond to become more attack-minded. As players develop and mature they should be more capable of winning their battles without a numerical advantage. If I was manager of either side, I’d make sure that once the sweeper system was second-nature to the players they hurled different ways in challenge games and meaningless games like the Walsh Cup. Get guys used to competing 1-v-1. Get them used to long ball into the square. Not shooting outside the 45. Use the meaningless games as conditioned training games, but against top opposition. Build the arsenal needed to change tactics in big games. Clare could have done with something like this on Saturday. The sweeper has its place, particularly when you’re an underdog, but you need more too. Davy and Michael cool the beans lads. Ye are both right. If you play a sweeper in defence that player, after the ball is won they have to carry the ball effectively to set up scoring chances. Inaccurate hand passing and not carrying with overlaps lead to aimless ball from both sides. Defenders need to be very comfortable with the ball. Some are but needs all 7 to be. Absolutely Sean. The coordination level has to be excellent if there’s a sweeper, as attack will have to be more focused on carrying and short passing. Liam Ryan for example is developing this aspect well I think.